Our images of Christmas gifts usually include brightly colored wrapping paper, colorful bows, and eye catching gift bags under the tree. And all of that is good. 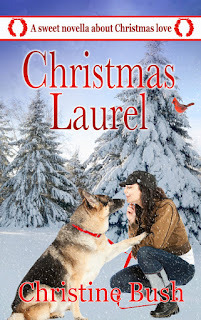 But there are so many other kinds of Christmas giving that can be inspired by the joy and emotion of the holiday, and sometimes I think those kinds of gifts are even more meaningful, both for the receiver and the giver. For loved ones, sometimes it’s the gift of time. A card or letter including a promise of a day together, or tickets to a favorite performance can be the most meaningful of all to the ones we love. On other occasions, a collection of needed articles, organized by a family or group of friends, can make life much richer for the recipients. Years ago, when my kids were younger, we decided as an extended family to do a Christmas project for a school on the Navaho Indian Reservation in New Mexico. Instead of our usual “cousins” gift exchange, everyone purchased school supplies like writing paper, copier paper, crayons, markers, scissors, art supplies and pens and pencils in whatever quantity they could afford. The gifts were bundled up and shipped to our then unknown friends with Christmas love. It was an ENORMOUS bundle. It was very appreciated, and we are still in touch. And I have to admit, my kids remember projects like this to this day, far longer than the memory of any Christmas toy they received. I’m thinking that this spirit of Christmas giving can and should be expanded to the rest of the year too. I am thinking about that lately in a more definitive way lately, with the heightened awareness of those in our world who need so much. I’m sure some readers here have come up with some wonderful giving ideas, whether for Christmas or at random. Suggestions? I’d love to hear them! 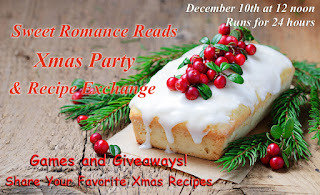 Come and join the authors of Sweet Romance Reads at the Xmas Party and Recipe Exchange on Dec 10th from 12 noon. Find the party HERE!